Macy’s has released their Black Friday Ad for 2018. Here you will find the best Black Friday deals at Macy’s. Macy’s will open on Thursday, Nov 22, at 5pm (Thanksgiving). Online Black Friday deals will begin at midnight on 11/21 (most likely 9pm pst time). There is a $10 off $25 coupon & $20 off $50 coupon as well as many free after rebate items. We will have a list of highlights soon, so check back later today! If you’d prefer to do your shopping at home on Thanksgiving or Black Friday, make sure to check out Macys.com and often they will have similar deals online as well as in the stores. 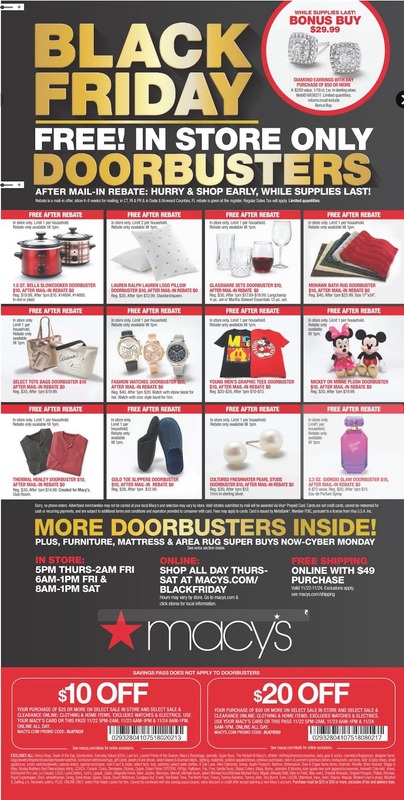 Make sure to check out the complete Black Friday Ad Scan for Macy’s.